S:Bust:29.9-33.9", Waist :26.8-30.7", Top :11.4", Bottoms :8.7". M:Bust:31.5-35.4", Waist :28.3-32.3", Top :11.8", Bottoms :9.1". L:Bust:33.1-37.0", Waist :29.9-33.9", Top :12.2", Bottoms :9.4". S:Bust:31.5", Waist :25.2-29.1", Hip :26.8-30.7", Top :11.0", Bottoms :10.2". M:Bust:33.1", Waist :26.8-30.7", Hip :28.3-32.3", Top :11.4", Bottoms :10.6". L:Bust:34.6", Waist :28.3-32.3", Hip :29.9-33.9", Top :11.8", Bottoms :11.0". S:Bust:27.6-33.1", Waist :24.4-33.9", Hip :27.6-36.2", Top :9.4", Bottoms :9.8". M:Bust:29.1-34.6", Waist :26.0-35.4", Hip :29.1-37.8", Top :9.8", Bottoms :10.2". L:Bust:30.7-36.2", Waist :27.6-37.0", Hip :30.7-39.4", Top :10.2", Bottoms :10.6". S:Bust:26.8-33.1", Waist :26.0-33.9", Top :9.4", Bottoms :7.9". M:Bust:28.3-34.6", Waist :27.6-35.4", Top :9.8", Bottoms :8.3". L:Bust:29.9-36.2", Waist :29.1-37.0", Top :10.2", Bottoms :8.7". S:Bust:31.5", Waist :26.0-29.9", Top :10.2", Bottoms :10.2". M:Bust:33.1", Waist :27.6-31.5", Top :10.6", Bottoms :10.6". 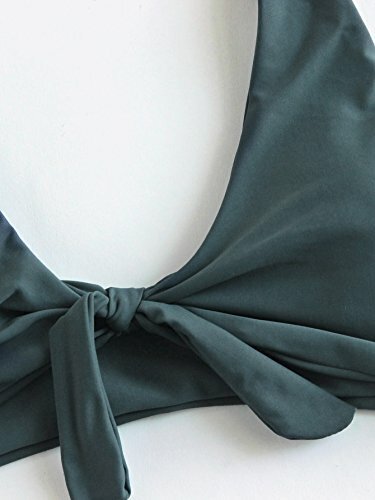 L:Bust:34.6", Waist :29.1-33.1", Top :11.0", Bottoms :11.0". S:Bust:26.8-30.7", Waist :26.8-30.7", Top :10.2", Bottoms :9.1". M:Bust:28.3-32.3", Waist :28.3-32.3", Top :10.6", Bottoms :9.4". L:Bust:29.9-33.9", Waist :29.9-33.9", Top :11.0", Bottoms :9.8". S:Bust:28.3-32.3", Waist :26.0-29.9", Top :11.4", Bottoms :8.3". M:Bust:29.9-33.9", Waist :27.6-31.5", Top :11.8", Bottoms :8.7". 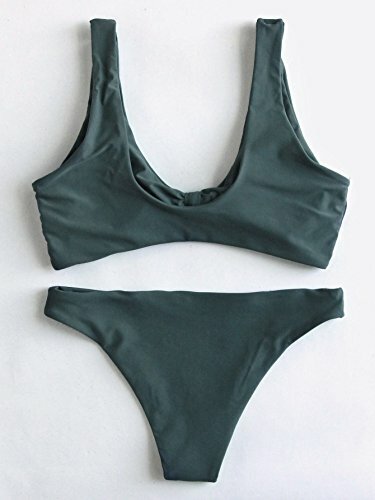 L:Bust:31.5-35.4", Waist :29.1-33.1", Top :12.2", Bottoms :9.1". Notice: Plaid-Red Color No Chest Pad! 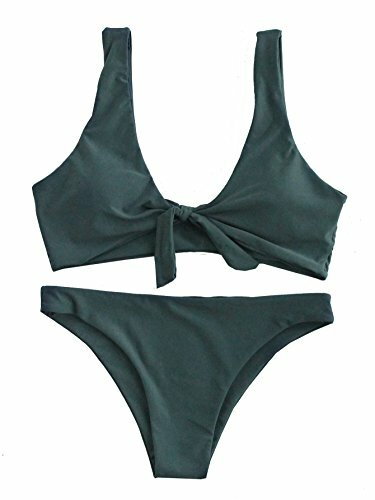 Features: Tie Knot Front, Two Pieces Swimsuit for Women. 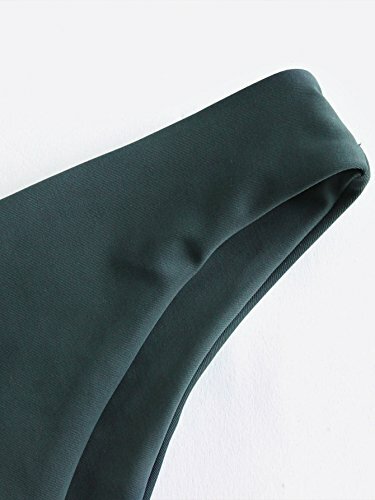 Soft with Good Elasticity, Comfy to Wear. OCCASIONS: Tropical Vacation, Beach Party etc Machine Wash/ No Bleach Please refer to our Size Chart(Not Amazon).Please refer to our Size Chart(Not Amazon).Recommend to CHOOSE One/ Two Size Up!